PRESIDENT Lungu has unveiled a three-option plan to deal with the looming food crisis in the wake of a devastating drought that has hit most parts of Zambia. 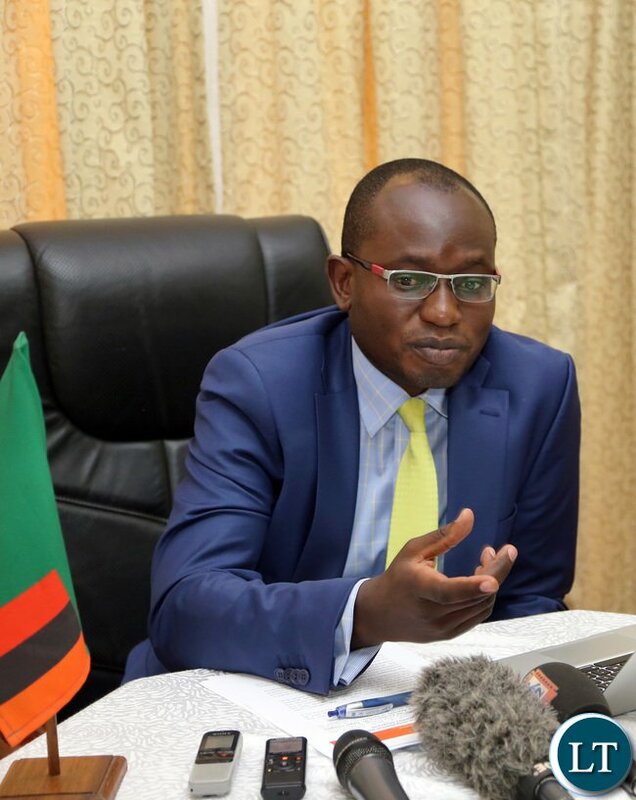 Special assistant to the President for press and public relations Amos Chanda told journalists in Mfuwe on Tuesday shortly after Mr Lungu wrapped up his three-day visit to Eastern Province that one of the options the President is considering is the growing of irrigated maize to meet the shortfall. The second option on the President’s table is to engage the Food Reserve Agency (FRA) and farmers’ union to “mop up” all the maize in the country, as well as to assess the deficit. Mr Chanda, however, said there is information from both the millers and farmers’ union that there could be sufficient maize in the country. Mr Chanda said if it is established that there is a deficit and local farmers cannot grow enough irrigated maize to fill the gap, importation would be considered as the last option. “The President is committed nevertheless, whatever the option, to ensuring that there is sufficient food in Zambia and no-one will starve,” he said. Mr Chanda castigated United Party for National Development (UPND) president Hakainde Hichilema for criticising the President’s plan to avert hunger. “When you criticize the three options, then you want the Zambians to starve so that you can extract political capital out of that,” he said. Mr Chanda said it is wrong to seek success on the back of national failure. “Mr Hichilema wants Zambians to starve and then he goes to them and offer himself as a messiah; that opportunity will not come because the President will ensure that there is enough maize,” he said. Mr Chanda said President Lungu will ensure that money is found for maize imports, if it comes to that. He said the President’s appeal to the opposition is that “there comes a time when the nation must rally behind one cause and ensure that the poor are not disadvantaged”. Mr Chanda said the maize Government could import is not stockfeed, as some people are suggesting, but it is white maize similar to the one grown and consumed locally. And Mr Chanda said President Lungu wants a gradual increment of electricity tariffs in order to lessen the impact on the poor. He was responding to a question as to whether President Lungu intends to renege on his recent decision to revert to old Zesco tariffs when he called for sacrifice in reference to the power crisis affecting the nation at a public rally in Sinda. Mr Chanda explained that when the President called for cost-reflective tariffs in Parliament last year, the idea was to have gradual increment rather than a “sharp shock” adjustment. He said the plan must be done in a way that it does not hurt the poor. And Mr Chanda said President Lungu is happy with the response he received during the tour of Eastern Province and that he would soon travel back to the province to visit the remaining districts. On his road tour, the President visited seven districts: Luangwa, Nyimba, Petauke, Sinda, Chipata and Mambwe, covering over 700kms by road. The President also held closed-door meetings with Chewa, Ngoni, Nsenga and Kunda chiefs. Mr Chanda said that during the private meetings with the chiefs, the President asked them to help in fighting tribalism, stop political violence, as well as to help in identifying areas and families that will need food aid. Mr Chanda said the chiefs assured the President that they will help to fight tribalism and also offered their support to the government in its development plan. Irrigated maize is the plan by the president. will this be done at the statehouse? These plans are made in the mouth nothing real really to show. How is the president going to grow the maize? ZNFU/FRA to mop up all maize . … LMAO, you guys are not serious really, is this the time you think of mopping up when you exported most of the maize just to fill your pockets. Bwafya kwena. Ba PF na bo, HOW WILL YOU IRRIGATE CRPOS – YOU HAVE NO ELECTRICITY, NO FUEL zo ona, IRRIGATION WITH NO VISION!! I guess the only thing the can score points for, is fertilising crops with the PamaFI that they produce!!! Did you know that Zambia has got only maize storage capacity of only 1.1 million tonnes and we need about 2 million tonnes. Did you know that FRA is chronically underfunded to buy strategic good reserves and mostly only have enough money to buy 300, 000 tonnes from farmers. If they don’t export, the maize will go to waste and they will not be able to pay for all of it without needing more funding from GRZ. These 2 issues usually force the FRA to export maize during the bumper harvests even if it’s not in the best interest of the country (and usually at very low prices to Zimbabwe) . Until we sort out these issues we will be singing the same song for years to come. The politicians know that but they won’t say anything because they have been sleeping on the job. @ house fly,bushe kanshi ninshi mu fwaya? You are not giving solutions,just critising everything gov’t says.see that is why someof us can’t vote for UPND,we don’t want another five years of excuses,iyo we are sufering becoz pf had no plans and so andso yet you also have no plans all you want is get to state house.wakeup zambians change wil not change your living but wil change their living. MOVE THESE GRAIN-BELT FROM THE SOUTHERN PART OF ZAMBIA TO THE NORTHERN PARTS OF ZAMBIA ENHANCE WITH IRRIGATION DAMS IN CASE OF DROUGHT. Then why are we still exporting maize??? Is Lungu demented or what? How can he expect farmers to grow irrigated maize when he has just increased electricity tariffs by 300%? And why should anyone grow a crop that is under threat of price controls as PF panicks under elections fever? Too little too late. Nevertheless, time will tell. What are thes clowns thinking? All the farmers with irrigation facilities are just sitting around doing nothing waiting for Lungu to tell them to grow maize? You people are INSANE! COMPLETELY MAD! If you had just the slightest understanding of how farming works you would realise how ridiculous this statement is. Zambia went from surplus harvests with MMD+Rupiah to food crisis with PF,from robust BB+ economy with RB to ratings downgrades by Moody’s and Fitch. PF surely had no vision beyond winning elections. And they still have not made any progress on their “vision”. Winning elections by lies seems to be the only thing PF is actually capable of. Iwe Chanda tifuna ma figures ASAP. How many tones of maize is left in reserve? Have you liaised with Lubinda to actualise the situation? We re in January and honestly you do not know the food security situation of our country? And you say “mop up”? Are you guys sane honestly? Let me remind you and Chagwa again; starving people with a motive of gaining voting mileage is crime against humanity and the ICC re watching our country with a keen eye as we approach August. If it comes to the worst ask Chilala at Chimsoro farm in mkushi he is able to feed the whole country during your made up food shortage period. PF dont do figures in case they end up in court. They are scared of numbers, be it actual amounts of tonnage maize, cash manee amounts raised by exporting maize, or anything else. If they published figures, that would mean having to do work and thier stealing might be exposed. When did you become “learned”? Or your interpretation of “learned” means been blind to the stark reality. Chanda says “…it is wrong to seek success on the back of national failure…”, well has the Nation failed its People or the Patetic Failures hawe succeeded in destroying economy in the misplaced quest of “unprecedented development” driven by selfish institutionalized corruption? Seven billion USD of debit for what? You must be a cadre.Are you also wondering why we are getting $200 landed cost in Zim when maize grown in Zim is costing $300 per tonne? Makasa – That is very good, but why can’t the FRA Director issue such a statement? This is where things go wrong. Alarmists are all over the place and yet people entrusted with the truth are quiet – who are they representing? You are right Mr. Chanda, it is wrong to seek success on the back of national failure. Therefore, why not pack-up as this administration has FAILED miserably? Let others tray to create success from your FAILURE. Just shut up iwe clerk.You are contradicting the Head of State who has declared that we will run out of stocks by June and may have to import. Southern province has always been hit by hunger since they started voting for HH because he has promised them free food once elected president. Because of that promise they have back peddled on farming and are now concentrating on politics hoping that one day the dream may come about a Tonga leading Zambia. Look at northern central eastern cb and Lusaka their focus is not politics. It’s only in southern where you get 100% turnout of registered voters. Kikiki…. Ba UPND you have all the answers but you still loose elections why?. Simple Zambians have realised that you are just arm chair criticts who have no idea on how government works in short you and your Ka god HH are liars! You f00ls eating with government should be the last ones to make noise.I was buying mealie meal at ZMK30 in 2011 when you convinced pipo to vote for the illiterate dictator,we were buying the dollar at ZMK4.7,our inflation rate was in single digits,our national debt was at$1 billion plus I don’t even want to talk about budget deficit figures,interest rate etc.I am Bemba and I abore tribalism but I am going to vote for hh coz I don’t want to die of hunger or avoidable disease. How can you ask Chiefs to help stop Political violence? Its politicians who should tame their cadres or vigilantes. The Party and its Government (PIG) has the power to curb political violence for instance by banning carrying of offensive weapons and sharp instruments /objects in public. Its politicians who ferry unruly cadres to stir trouble and not Chiefs. Which farmers are going to plant crops when there is LOAD SHEDDING and halfway through they will lose all their investment? Be serious you people. THINK before you go to the press with such childish ideas. We need proper PLANS! Not Sata style wake up one morning and decide to rename airports! That is not a plan. That is just dreaming up stuppid ideas that any grade 5 will tell you cannot work. Makasa, for your information I HAVE SUBMITTED PROPER PLANS to this Government. They have been ignored! I am not any political party, and I am definitely not trying to insult anyone. But I cannot remain silent when such total ignorance is publicly displayed by Amos Chanda on behalf of President Lungu. Such talk must be treated with incredulity! Is it possible that people entrusted with the affairs of the Nation can be so far out of touch with reality that they make ridiculous statements like this? Just to show how crazy this is you only need to ask ANY FARMER IN ZAMBIA if he will grow maize under irrigation that is not for sale as green cobs? These so called “plans” are not plans. They are just crazy ideas by people devoid of COMMON SENSE! Mr. “interllectual”, go and learn spelling before pretending to be “INTERLLECTAL”. You mean there is completely no electricity – zero? Lazy people will always find excuses. And from where farmers are going to find money for electricity after recent 327% increase? ..continued ..and you have not done crop forecasts to estimate the likely deficit? If you have grow maize by irrigation to fill up the deficit starting early may even help as irrigation may just be used to supplement the erratic rainfall in which case the cost of irrigation may not be so high- something you needed to decide on like yesterday! Please address the problem as the pain of hunger is real and avoid making political capital of your responsibility by looking at everything HH says as intended to woo votes even when he is taking facts and stating the obvious! Lungu must wake up and catch up! This rubbish from Amos Chanda is not a plan. It is daydreaming! It looks like something a naughty schoolchild presents to the teacher as homework when he forgot to do the homework. The People of Zambia are paying Lungu a huge salary to fix these problems. They are NOT paying him this salary to campaign to get re-elected. He must get his priorities right! He should be very, very careful and pay attention to his work. Any more failures and bungling like this and Zambians could resort to a Gaddafi solution! For me that is why I do not mind him winning.He will regret winning coz him and PF have no solutions to the problems created by PF.Let him win coz when I look at him he does not have what it takes to stomach disappointment.And the pipo that voted for him who today support him will regret their decision. Sorry no more experiments with leadership.We live but once and you will die from hunger whilst ECL is chilled at State house sipping on his gin and tonic. So they are just guessing…they don’t know any facts…..they don’t know how much maize is in depos…..they don’t know how much is being exported……they don’t know if we have adequate storage…….this all very convinent if you are a thief, there are records of figures to show you are stealing. When do we establish that we will have a shortfall & by what quantity. Which farmers will do the irrigation farming & by what hecterage. How will the money be found. Abracadabra. Harvest for the current crop is in the next 4-5 months & CNP Kadansa still doesn’t have projections in place. TIZ (this is Zambia). Imwe bonse who insist a leader must be a graduate or at least grade 12 minimum. Is there evidence that these leaders in govt are educated? When kateka, (lungu) opens his mouth to voice his thoughts, what pops out is what you expect a retarded kid to say. He has come up with a three pronged approach to solving impending hunger, one of these ‘out of the box’ thought is ‘irrigated crops’. Is irrigation infrastructure already in place and all small scale farmers have access to the water? 1) Farmers with irrigation grow WHEAT during the winter season. They get paid $450 per ton currently for their wheat. These farmers are not sitting idle looking for maize business. Unless of course, you make it worth their while, and K75 per bag of maize ($133 per ton) is plain childish dreaming. 2) Besides water, maize needs heat and sunshine. Winter yields are not worthwhile for maize. 3) Lets see if I have understood this right. We have the worst drought in recorded history in Southern Africa. Dams are empty, boreholes are running dry. But you will grow maize under irrigation using dams and borehole water ? Uhhh, are you guys serious about this suggestion ?? 4) Whatever the expected irrigation capacity, divide it by half due to loadshedding hours.